Two graduates from the Department of Architecture & Civil Engineering worked together on the design team responsible for the Olympic Velodrome. 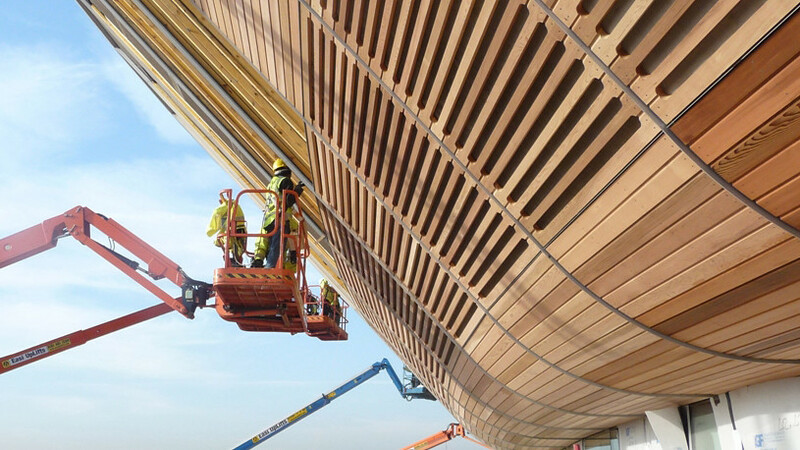 Engineers work on the façade of the Velodrome during construction. The £105 million Velodrome cycling arena was the first venue completed at the London 2012 Olympic park. It formed part of a major transformation that turned a discarded corner of London into an ultra-modern sports complex. The 6,000 seat Velodrome hosted 28 Track and Paralympic Cycling Track events at the London 2012 Olympic Games. The design team for the project included Principle Architect Jonathan Watts, from Hopkins Architects and Principle Structural Engineer George Watts, from Expedition Engineering. The pair, who collaborated on the upper bowl and roof of the arena, are graduates from the Department of Architecture & Civil Engineering. Jonathan graduated with a BSc in General Architectural Studies in 2004 before completing the Masters of Architecture in 2007. George graduated in 2003 with a first class honours MEng in Civil & Architectural Engineering. The Velodrome’s unique structure remains an iconic feature of London’s landscape today. The visually appealing venue is also the most sustainable for design and construction built at the park. The successful union of aesthetics and functionality is testament to the benefits architecture and civil engineering students gain from working together in a joint department at Bath. The venue design makes optimal use of natural light, reducing the need for electric lighting and cutting energy consumption. The low roof also reduces the amount of heating needed, whilst creating a great atmosphere for spectators. The cycling track was created with wood certified by the Forest Stewardship Council. The 100% naturally ventilated air system eliminates the need for air conditioning.